Donkey Kong has kidnapped Pauline, so Mario has to guide his Mini Mario toys through the obstacles and to the goal in order to confront the ape. You have to use blocks, levers and other items to keep the Minis safe, as once they start walking they don't stop. 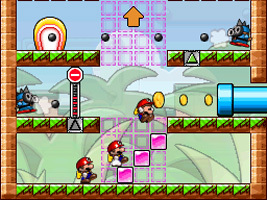 In later levels you will also find Mini Peach, Toad and Donkey Kong toys that will help you in different ways. A level editor is included, allowing up to 140 stages to be created and saved. You can share the levels with other players locally or over the Nintendo Wi-Fi connection.